If you're reading this, you probably have a car... most likely a Saab, even. Your Saab does many things, it moves, it stops, it turns, and inevitably it breaks. I'm going to venture to say that about 60% of the "HEY! I'm on the side of the road and broken down" calls I receive are specifically related to serpentine belt or pulley failures. What is a serpentine belt, you ask? The Serpentine belt and its various pulleys can be seen on the left side of the engine in this photo. A serpentine belt is a multi ribbed rubber belt which operates the engines various accessories such as air conditioning via the AC compressor, the charging system via the alternator, the power steering system via the power steering pump, and the cooling system via the water pump. It is driven by a single power pulley, known as a crank pulley, which is externally mounted on the engines crankshaft. Tension on the belt allows for the friction of the belt against the various other pulleys to operate these pumps and devices. Tension is applied and removed from the belt via a tensioner with a pulley that adjusts and absorbs shock as the belt turns. Saab 9000's use a hydraulic tensioning system with a shock absorber, whereas NG900's, 9-3's and 9-5's use a spring loaded mechanical tensioners. Classic 900's (79-93) use a multi belt system which total 4 belts and has mechanical non automatic tensioners which must be adjusted by hand. Anywho, the serpentine belt and its pulleys receive much wear and stress from its constant turning while the engine is operating. The belt is engine speed dependant, so the faster the engine is revving the faster the belt is turning. 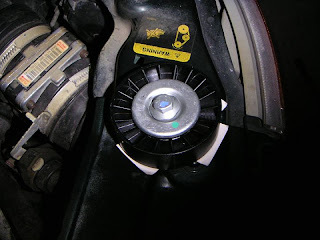 The pulleys on the accessories, such as the AC compressor, alternator, waterpump, and power steering pump are fairly resilient and do not typically wear (but I would suggest replacement if the parent component is replaced), however, there are two (in some cases 3) specific pulleys that cause problems for Saabs. The pulleys in question are idler pulleys and the belt tensioner pulley itself. They do not drive any specific function on the car, and since they are hard mounted on the side of the engine itself, they contain bearings which allow them to turn. Their purpose is solely to direct or provide tension to the belt itself. The bearings they contain wear over time and the pulleys can separate from the bearings, which will throw the belt off track, stop the critical functions of the car from functioning, and will leave you stranded where you are. Also, the serpentine belt can become weak over time and will snap, also leaving you with the same scenario. However, from personal experience, the pulleys will let go before the belt does, as untrained technicians will many times replace the belt but not the pulleys. I follow Saab's suggested service listing for these bearings, and that is replacement every 60k miles. The pulleys and serpentine belt are included in the 60k mile service, but as stated before, that does not mean they are always changed. The lesson here is check your belts condition. Belts and pulleys will sometimes make noise and give you some warning before they go, but many times they just go. When you come to me for an initial service, this is one of the first things I will check and suggest to you as a client to keep you motoring safe and happy! Parts cost varies per model, but an idler pulley, tensioner pulley, and serpentine belt replacement usually runs in the $250 range with labor included. Please leave comments to let me know how you guys are liking the blog. Also, if anyone needs anymore clarification or explanation, feel free to ask! Thanks Jeff, glad to know it is appreciated! Hi Chad, Your info here sure helped me understand when it happened to my car. So pep boys (emergency service) replaced my idler pulley & belt. Then my sid was displaying fill coolant fluid. My suspicion is they drained it when they did the work. Is this possible? I have a 2000 9-3. Low miles 63K and just had the major service by my dealer this spring. I am in the process of replacing my 1999 9000 seroentine belt for the 10th time. Car had 118,000 milesand this failure is unexplained by SAAB. Just money being spent again and cannot trust car on any long trip.. 3oo miles or more. Have also replaced the tension assembly each time. Here is a useful fact. If you have a 9-5 V6 model and your tensioner pully starts making noise, you should replace it immediately. If it goes (and they do about once a year) you have to REMOVE THE ENGINE MOUNT to change the belt. And yes it is a bit of a nightmare. I keep a spare pulley in my trunk. It takes about two minutes to change. I hope you can help. I'm trying to bypass the broken AC compressor, as in the Euro option. Do you know what part number for the serpentine belt? My pulley/belt just almost caught on fire today. Thanks very much indeed for your helpful post on this subject. 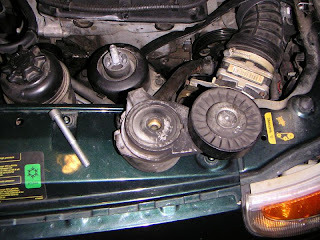 If you are changing the serpentine belt tensioner pulley yourself, remember that the bolt is a reverse thread. Also be careful not to overextend the damper shock on the tensioner assembly. The factory uses a special c- shaped tool to hold it together while the belt replacement is being performed. A home made tool may also be fabricated easily to accomplish this. What may look like a fuel pump failure may be the failure of the crankshaft position sensor behind the crankshaft pulley. It is a small electronic component called a Hall Effect device, with 3 wires attached. A SAAB/Bosch part can set you back up to $300, the actual component is made by Honeywell/MicroSwitch part number AV16F that costs about $24 in the USA. Check for it at Radio Parts Group. When it fails the fuel pump relay drops out as a safety measure. Thanks, very helpful, since I don't know EVERYthing about my car. 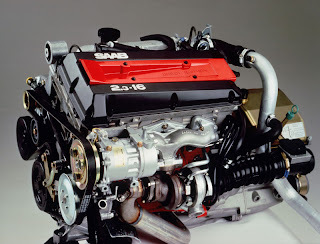 Saabs are complicated creatures. :) Thank you. 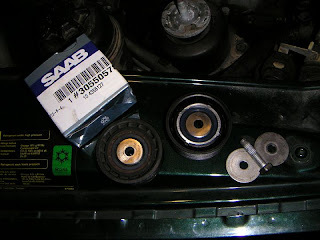 It is god to follow Saab's suggested saab service listing for these bearings, and that is replacement every 60k miles. I have a Sabb 1999 9-3, my aor conditioner pump went, and it was $1000.00 for a new one. I installed a shorter belt, and bypassed the air cond. pump. Under what circumstance would you need to replace the entire tensioner assembly and not just the pulley? I'm trying to change my belt but for some reason can't get anything into the tensioner because it's close to the frame, even the tension stick from the auto store is to big, any suggestions?